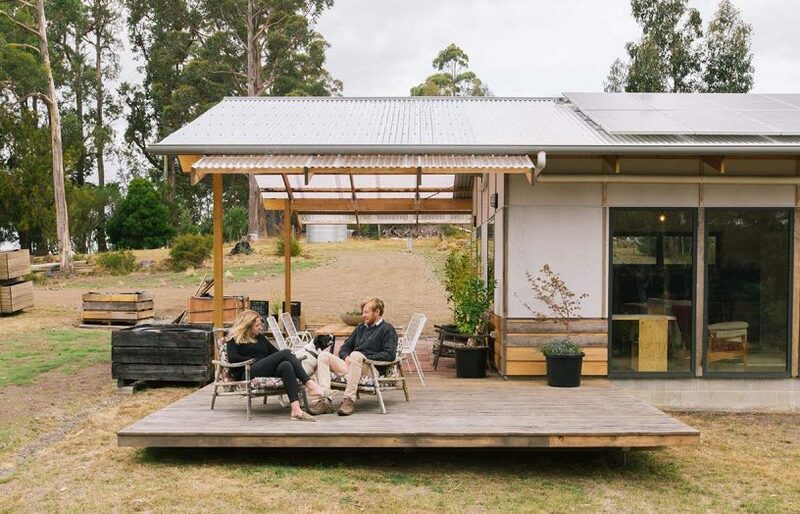 Homeowners Kazuhiro and Ayumi Watari asked for a house for their 986-square-metre site, with the basic elements for living, that they could complete little by little on their own. 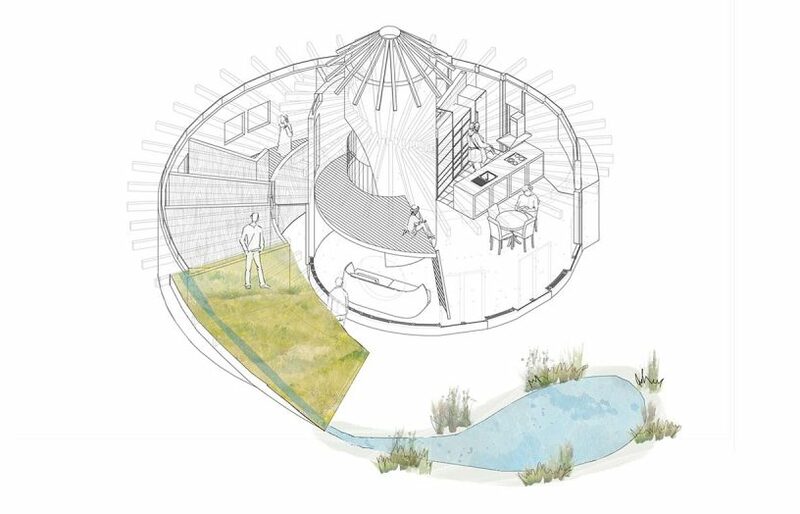 Over the next year they plan to plant a garden on the twisting roof that gives Spiral Garden House its name, and build swales and drainage ponds that radiate out from the house to handle excess rainfall. Some 20 years ago, I spent time living in Japan and studying its art and traditional architecture, with its emphasis on simplicity of design, lightweight timber construction, natural materials, and master handcrafting. 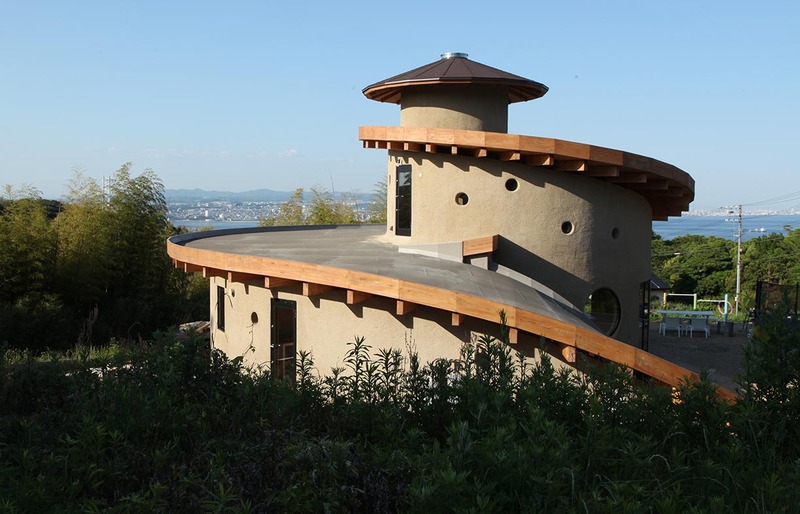 Modern residential architecture in Japan (as elsewhere) has largely moved towards the utilitarian, urbanised and mass produced, so when the Spiral Garden House came to my attention, I was intrigued. 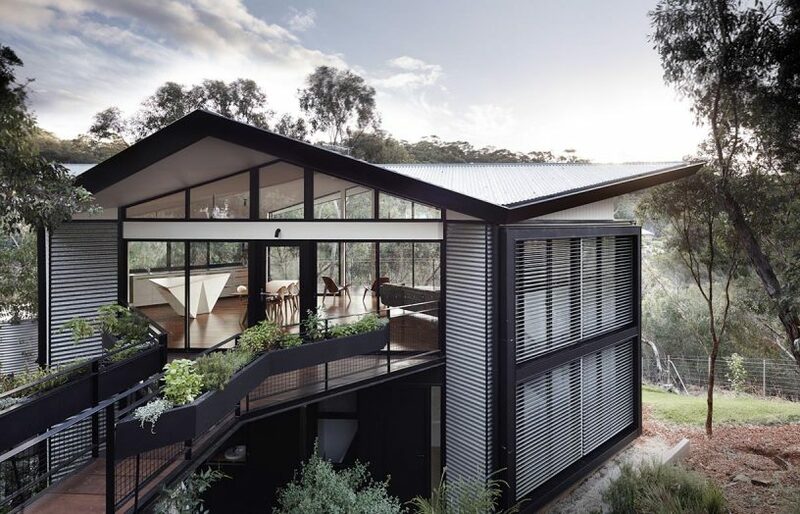 It combines traditional materials and construction techniques with a surprising design that is a radical departure from traditional architectural styles, producing a striking-looking and high-performing home. The house is a product of its location and the family who commissioned it. On the island of Awaji, in Japan’s Seto Inland Sea some 70km south-west of Osaka, the long-established fishing and farming community has been joined recently by a growing population relocating from urban centres, looking for a slower-paced lifestyle closer to nature. 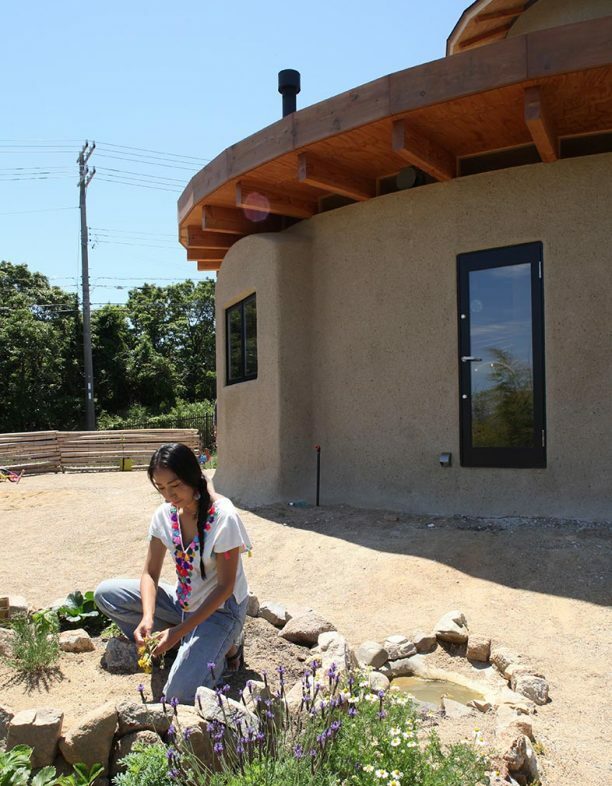 Kazuhiro Watari, his wife Ayumi and their two children are part of this new community, which has established a currency-free sharing economy, a forest kindergarten and a ’free schooling‘ cooperative. The Wataris approached Osaka-based architecture firm Ryuichi Ashizawa Architects, asking for a round house with a kitchen at its heart, good sun access and natural light, and warm in winter. 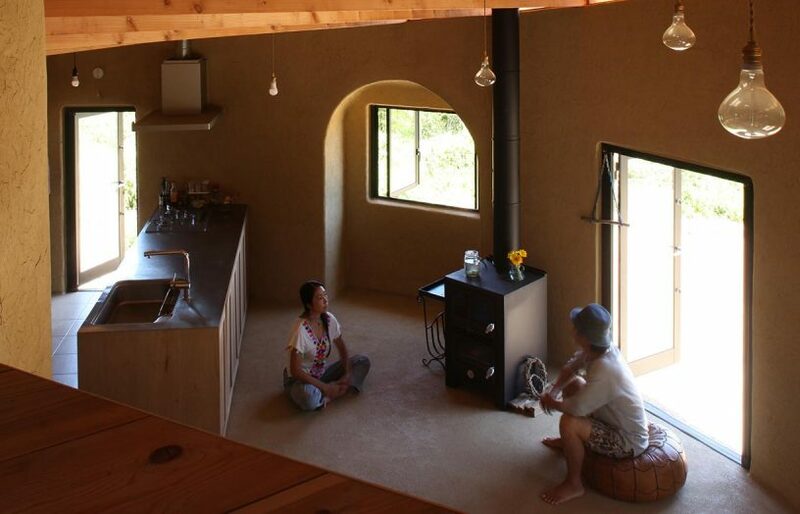 “Instead of a completely finished house, we wanted one with – at the start – just the basic elements for living, which we can complete on our own; a house that grows along with the family,” says Kazuhiro. The homeowners are currently experimenting in a small ground-level spiral garden to decide on the planting design for the green roof. The house design may be unusual, but the materials and construction methods were deliberately selected to reference the island’s traditional architecture, be appropriate for the climate, and be familiar to local craftspeople. 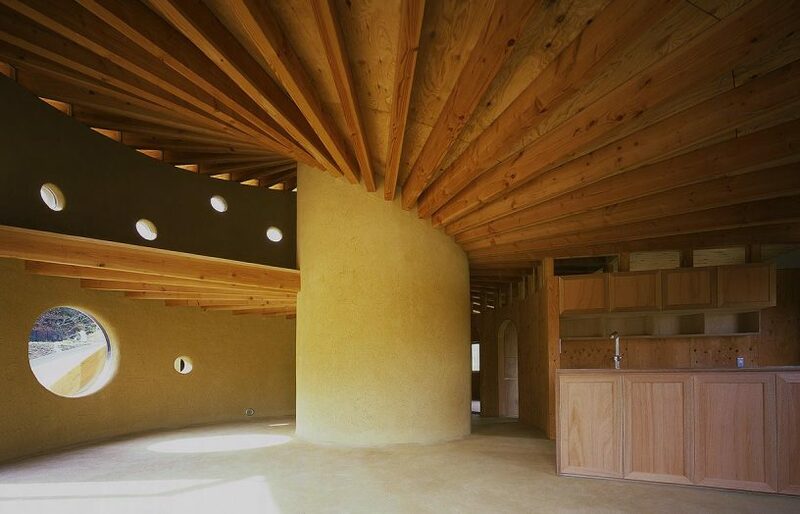 A hand-carved timber frame supports the spiralling roof, the walls are earth render over bamboo lattice, and the floor is of beaten earth. The core of the house is an “unassigned space” that’s 2.4 metres in diameter and 7.5 metres high. Tucked out of sight from the living area, the space inside the core can be used for meditation, guests or gatherings with friends. An openable skylight admits natural light and allows the space to function as a thermal chimney, drawing cool breezes through the house in summer. 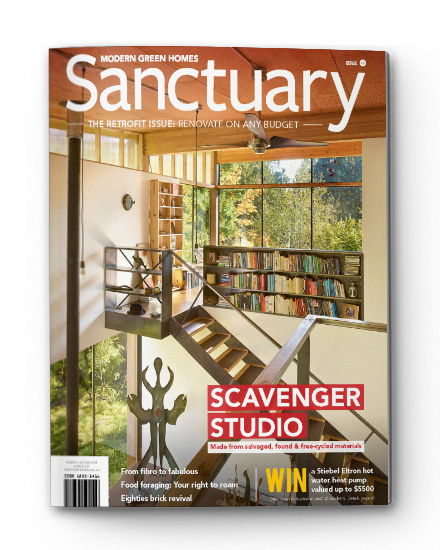 This request led the architects to a design process that stripped away the excess while keeping intact the essentials of a house based around family gathering. 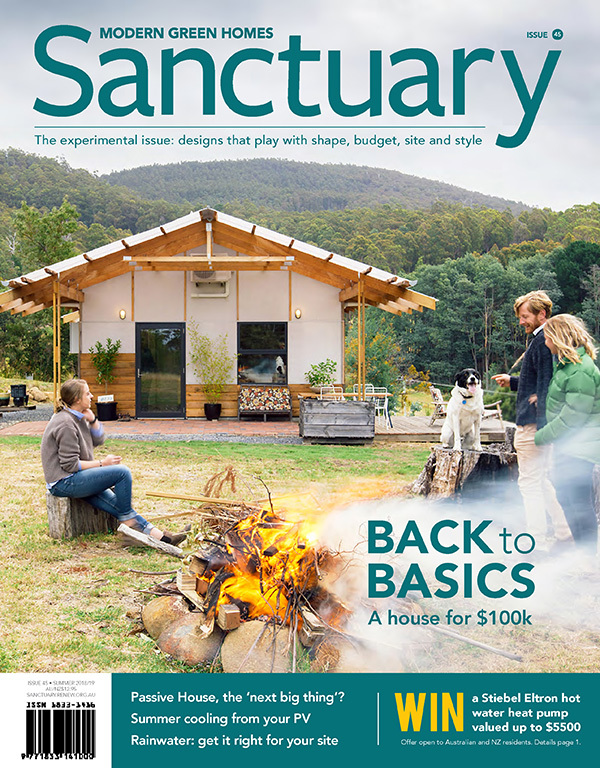 Considering the house and the landscaping of the 986-square-metre site at the same time, they settled on a continuous spiral design with a 7.5-metre-high circular central space that can be used for meditation or gathering with friends. With the help of an openable skylight, it also creates a cooling breeze in summer and can help distribute the warm air from the woodburning fire in winter. From this central space the plan winds out, fitting a sitting area with mezzanine above, a living area and kitchen, and on the fringes, a bedroom, bathroom and storage. 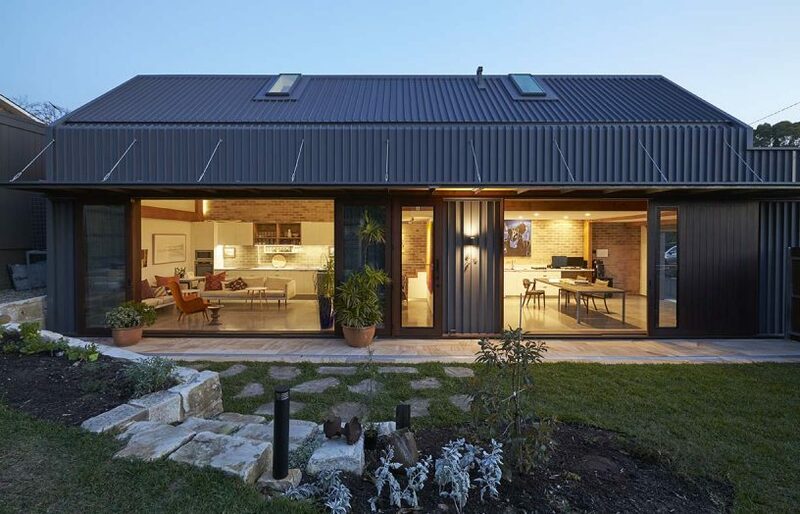 The roof will be planted as a garden, rising from ground level and connecting the house with its surrounding environment. “As it spirals up, it offers varying sunlight exposure, height and humidity, and so is able to support plants with diverse growth requirements,” explains the architect. 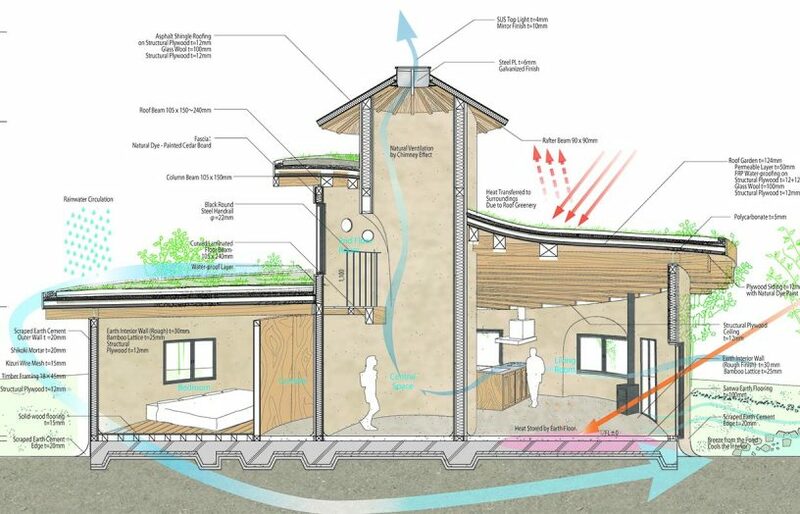 The roof garden also allows rainwater to flow gradually down to the swale and small ponds around the house, watering the plants along the way; the ponds will cool the air flowing into the house in the summer. Despite its unconventional form, the construction of the house takes cues from the island’s traditional timber-framed, earth-rendered homes. 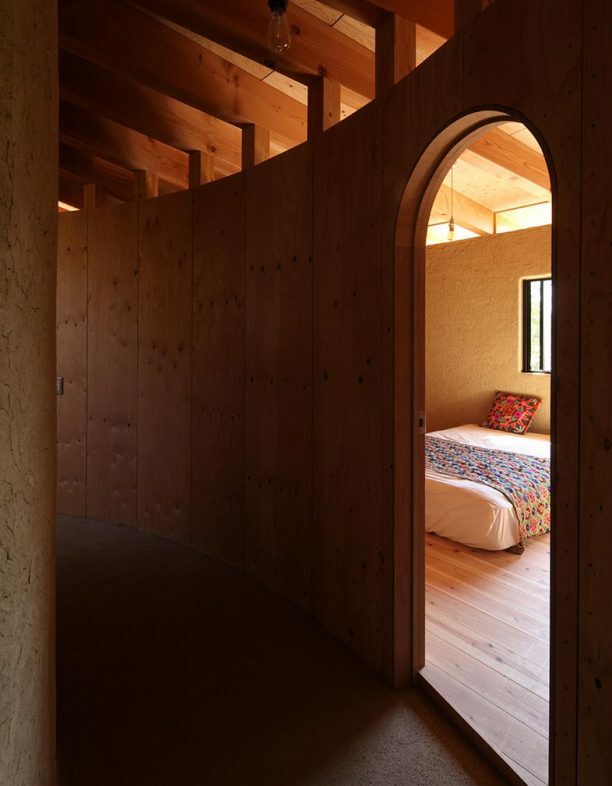 “We chose to use the natural materials – earth and wood – that have been utilised in this area for many years, and that match the climate of the region,” says Kazuhiro. “We also opted for traditional construction methods that would be familiar to local carpenters and craftspeople.” The hand-carved timber frame, with exposed roof beams radiating out from the centre, is finished on the inside with local earth over bamboo lattice; exterior walls are an earth and mortar mix, and the floor is of beaten earth. 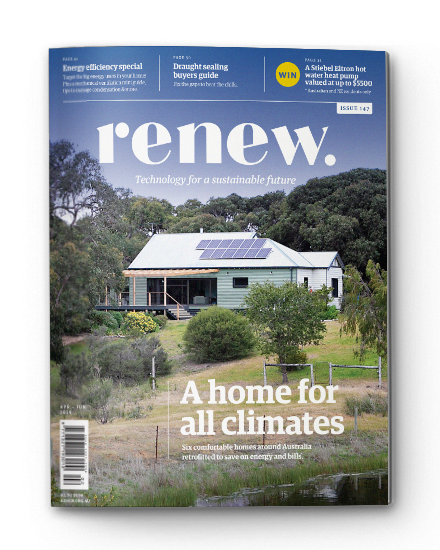 “The interior earth finishes are able to store heat and help control humidity,” says the architect. A corridor winds around the central space and leads to a spacious bedroom, bathroom and storage. Windows under the eaves between the roof beams allow in plentiful natural light.